This beachfront luxury resort is located in Mirihi, where regional attractions include Manta Point. Within easy reach of Himendhoo Thila, this Moofushi Island property is nestled on the beach. Regional attractions also include Ari Atoll and Malhoss Thila. Nestled on the beach, this Vakaru hotel is just steps from Vakarufalhi Beach and Manta Point. Nestled on the beach, this Huvahendhoo property is just steps from Ranveli Beach and Villingilivaru Island Pier. Dhangethi Beach is 0.2 mi (0.4 km) away. I don’t usually do reviews but have to say this resort is nothing short of fantastic. Yes there are other resorts that will offer you an ultra premium experience at multiples of the price. So why is it soooo good? One of the best house reefs in the Maldives no doubt about it. Straight off the beach and importantly the reef is close to the surface so you are fully immersed in the sea life. We saw turtles baby sharks moral eels and a dazzling array of reef fish in crystal clear water no more than 30 meters from the beach....stunning. Food is of an excellent standard and so is the service if you have been to maturitius it’s a similar excellent standard. I am not a diver but spoke to many guests who had a supreme experience. The different shades of aqua have to be seen to be believed. The only possible negative is the beach is relatively narrow but tbh we are beach lovers and managed to get a daily spot right outside our beach villa that was stunning. In short fantastic! Where to find Mirihi hotels near an airport? Where can I find hotels in Mirihi that are near tourist attractions? 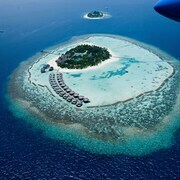 Planning to spend some time in Maldives and would like to stay in central Mirihi? Central Mirihi has 3 accommodation options within 0.1 kilometres (0.06 miles). Although Mirihi can't boast to having an extensive selection of accommodations near its city center, Mirihi Island Resort is convenient enough to satisfy most visitors. 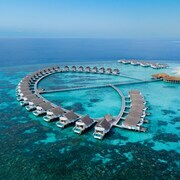 7 kilometres (4 miles) away from downtown Mirihi, is the Conrad Maldives Rangali Island. 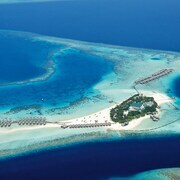 The Constance Moofushi All Inclusive is positioned 30 kilometres (19 miles) away. 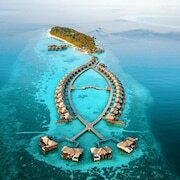 The Mirihi Island Resort and also the Diamonds Thudufushi Beach & Water Villas All Inclusive are some alternative hotel options in Mirihi. 85 kilometres (52 miles) from Mirihi is Felidhu Atoll, where you can visit Felidhoo Harbor and Thinadhoo Harbor. 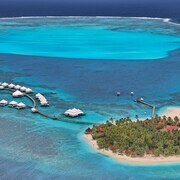 Felidhu Atoll hotels and accommodations include the Plumeria Boutique Guest House and Masfalhi View Inn. Alternatively, you could stay in Vilu Reef, 70 kilometres (45 miles) to the south of Mirihi, where you'll find the Angsana Velavaru and Sun Aqua Vilu Reef. The Meedhuffushi Island Pier and Meedhuffushi Island Beach are a couple of the most popular sites to check out in Vilu Reef. Male International Airport is a convenient airport, and can be found 100 kilometres (65 miles) from Mirihi. 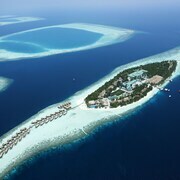 Conveniently located Expedia-listed hotels include Kurumba Maldives and Hotel Jen Malé, Maldives. What are the most popular Mirihi hotels? Are there hotels in other cities near Mirihi? What other types of accommodations are available in Mirihi? Explore Mirihi with Expedia.ca’s Travel Guides to find the best flights, cars, holiday packages and more!